Demand Planning is a crucial function of any organization, and Demand Planners need to constantly stay vigilant of the actual Sales and product movement and velocity across the Distribution Chain. To stay ahead of the curve, effective demand planners must track the right metrics that can help curtail possible demand planning issues ahead of time. 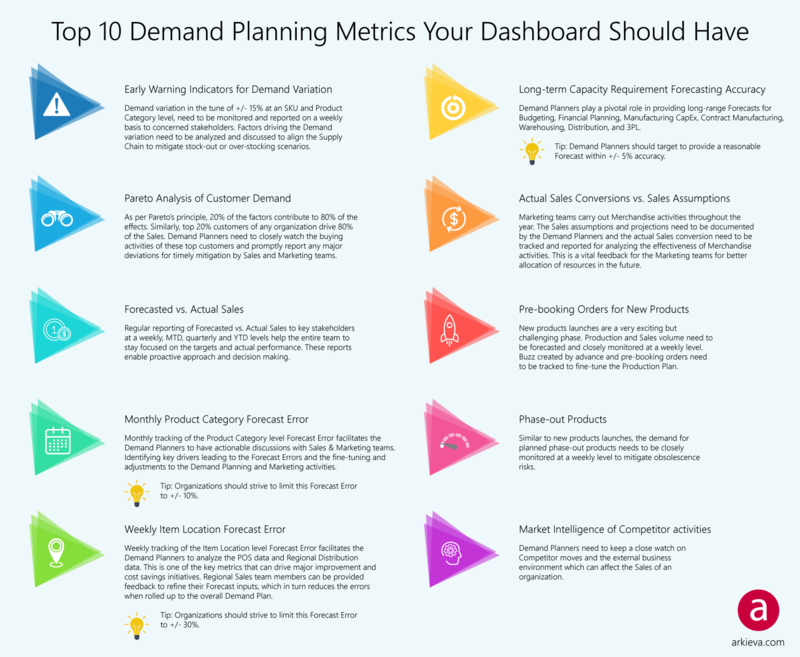 Here’s a list of 10 common demand planning metrics. Demand variation in the tune of +/- 15% at an SKU and Product Category level, need to be monitored and reported on a weekly basis to concerned stakeholders. Factors driving the Demand variation need to be analyzed and discussed to align the Supply Chain to mitigate stock-out or over-stocking scenarios. As per Pareto’s principle, 20% of the factors contribute to 80% of the effects. Similarly, top 20% customers of any organization drive 80% of the Sales. Demand Planners need to closely watch the buying activities of these top customers and promptly report any major deviations for timely mitigation by Sales and Marketing teams. Regular reporting of Forecasted vs. Actual Sales to key stakeholders at a weekly, MTD, quarterly and YTD levels help the entire team to stay focused on the targets and actual performance. These reports enable proactive approach and decision making. Monthly tracking of the Product Category level Forecast Error facilitates the Demand Planners to have actionable discussions with Sales & Marketing teams. Identifying key drivers leading to the Forecast Errors and the fine-tuning and adjustments to the Demand Planning and Marketing activities. Tip: Organizations should strive to limit this Forecast Error to +/- 10%. Weekly tracking of the Item Location level Forecast Error facilitates the Demand Planners to analyze the POS data and Regional Distribution data. This is one of the key metrics that can drive major improvement and cost savings initiatives. Regional Sales team members can be provided feedback to refine their Forecast inputs, which in turn reduces the errors when rolled up to the overall Demand Plan. Tip: Organizations should strive to limit this Forecast Error to +/- 30%. Demand Planners play a pivotal role in providing long-range Forecasts for Budgeting, Financial Planning, Manufacturing CapEx, Contract Manufacturing, Warehousing, Distribution, and 3PL. Tip: Demand Planners should target to provide a reasonable Forecast within +/- 5% accuracy. Marketing teams carry out Merchandise activities throughout the year. The Sales assumptions and projections need to be documented by the Demand Planners and the actual Sales conversion need to be tracked and reported for analyzing the effectiveness of Merchandise activities. This is a vital feedback for the Marketing teams for better allocation of resources in the future. New products launches are a very exciting but challenging phase. Production and Sales volume need to be forecasted and closely monitored at a weekly level. Buzz created by advance and pre-booking orders need to be tracked to fine-tune the Production Plan. Similar to new products launches, the demand for planned phase-out products needs to be closely monitored at a weekly level to mitigate obsolescence risks. Demand Planners need to keep a close watch on Competitor moves and the external business environment which can affect the Sales of an organization.